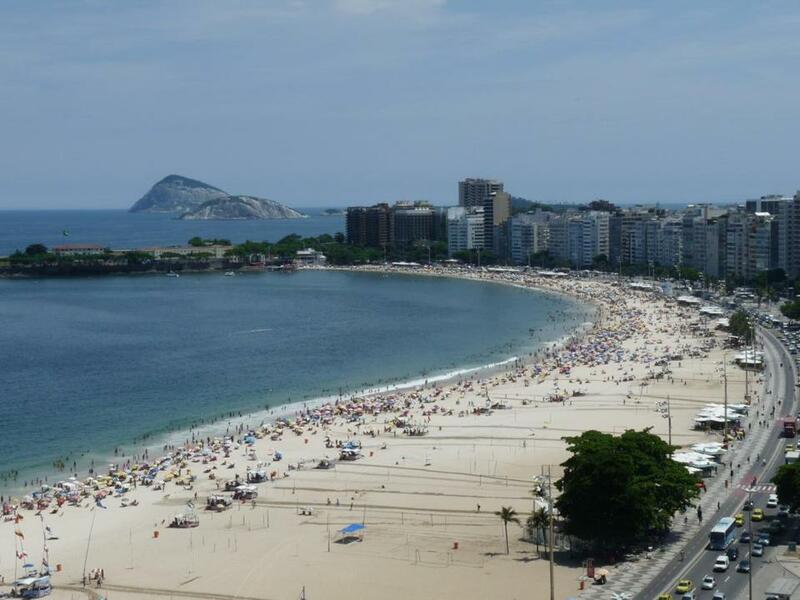 The famous Copacabana Beach in Rio de Janeiro. RIO DE JANEIRO — After a sleepless, nine-hour flight from Atlanta to Rio de Janeiro and a harrowing taxi ride from Antonio Carlos Jobim International Airport to our hotel, we get our first sweeping view of Copacabana Beach. It’s the moment we’ve been waiting for. From the hotel’s rooftop terrace, the broad crescent of golden sand peppered with colorful beach umbrellas and lined with pastel-hued hotels appears almost surreal — more like an oil painting than an actual place. White yachts skim across the Atlantic Ocean’s rippling blue water, and sun-bronzed beachgoers saunter along Avenida Atlantica, the main seaside boulevard. Once we slip into bathing suits and feel Copacabana’s hot sand warming the soles of our feet, we are swept into a festive carioca-style beach party. Samba music fills the air, and beach vendors shout “agua, cigarettes.” Families spread picnic feasts on blankets, and children splash in the surf. Local teams compete in futevolei, a Brazilian variety of no-hands-allowed volleyball. Kaleidoscopic kites on strings soar above like frigatebirds. After a beach walk, Doug and I sink into lounge chairs under a striped umbrella and watch the endless entertainment on Copacabana. The iconic beach is truly the heartbeat of Rio. That evening we join throngs of dog walkers along Copacabana promenade and dine at the Brasileirinho, a traditional restaurant decorated with hanging wicker baskets. We order moquecas a moda caicara, and our waiter brings a pot of savory seafood stew filled with fish and shrimp, which is served over rice with manioc flour and fish sauce. Copacabana is probably Brazil’s most well-known beach, thanks to legendary singer Carmen Miranda, a.k.a. the “Brazilian bombshell,” but it is certainly not the only one. The country is scalloped by more than 5,000 miles of sandy shoreline, just waiting to be explored. The best way to go beach-hopping in Brazil is by boat, so we have booked a stateroom aboard Oceania Cruises’ Nautica, which will sail from Rio north along the Atlantic coast and stop at five ports-of-call in Brazil. The next morning, we board the Nautica and then go sightseeing while the ship remains docked at Maua Pier overnight. We drive past the City of Samba complex, where the 12 most prominent samba schools compete for top honors at Carnaval, and then stop at the Cosme Velho station. A creaking cog railway carries us up Corcovado (Hunchback Mountain) to the towering Christ the Redeemer statue. As the morning fog clears, we catch glimpses of legendary Ipanema and Leblon beaches, which are more intimate and upscale than Copacabana. The Nautica departs Rio that evening, and the next morning we awaken to the lush, tree-covered hills of Buzios. A tender takes us ashore to the fishing village of Armacao dos Buzios, once a favorite haunt of European pirates and smugglers. Today well-heeled Rio and Sao Paolo families own luxury vacation homes in Buzios, which has become a high-end beach resort. We wend our way along the waterfront where fishermen are cleaning their morning’s catch and board an open-air trolley for a narrated tour of the peninsula. 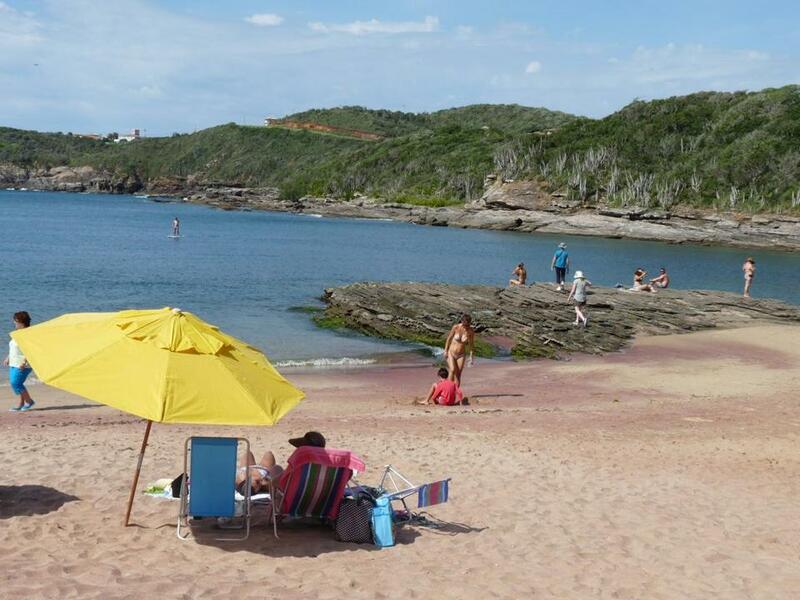 Buzios offers secluded beaches and dramatic coastal views. French movie star Brigitte Bardot “discovered” Buzios during a 1964 visit, and a life-size bronze statue of the actress on Orlat Bardot boardwalk still attracts paparazzi. “Buzios is a Brazilian St. Tropez,” says our guide, Diago, as the trolley lumbers past secluded Joao Fernandes, Brava, Forno, and Ferradura beaches and stops at overlooks for dramatic coastal views. Afterward, we stroll along cobblestone-paved Rua das Pedras, pausing for selfies with Brigitte’s statue, and continue to Pier do Central, an upscale commercial area. We shop for rainbow-colored Brazilian quartz jewelry and beach apparel in the boutiques on Passeio das Palmeiras. Before returning to the tender pier, we order cold beers at the Madame Bardot Bar and relax at a palm-shaded table overlooking the harbor. A rainbow glances off the sea’s mirrored surface, as the Nautica glides past Farol da Barra lighthouse and a shoreline studded with high-rise buildings. This is Salvador, Brazil’s third-largest city, but it looks more like Miami Beach. Founded in 1549 by the Portuguese, Salvador became Brazil’s first capital during the slave-trade era, and the slaves’ descendants have enriched its distinctive Afro-Brazilian culture. “Rio is the heart and Sao Paolo is the brain, but Salvador is the soul of Brazil,” says historian Don Klein during a shipboard lecture. 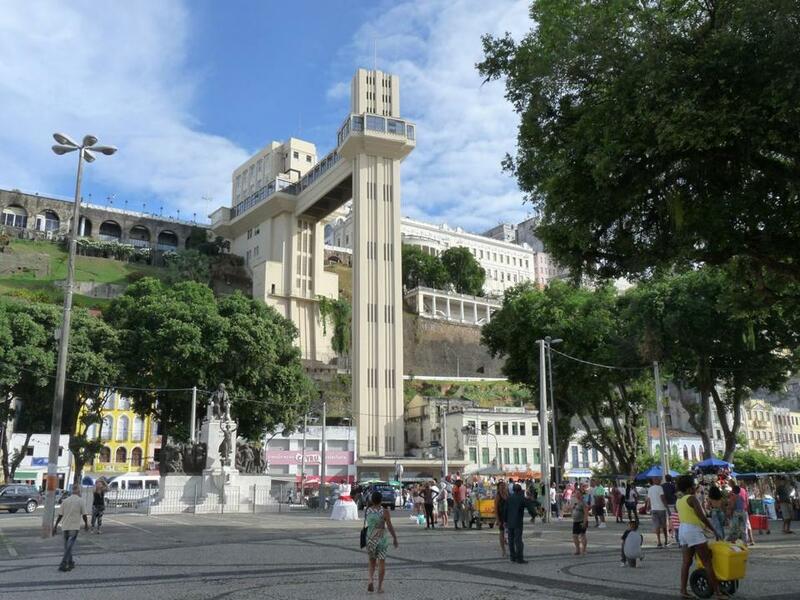 In Salvador, the Lacerda Elevator whisks passengers from the lower city to the upper city. For 15 centavos (four cents), we take the 1873 Lacerda Elevator (the world’s first public lift) from the Cidade Baixa (lower city) by the bay to the Cidade Alta (upper city) on the cliff. It’s the cheapest, most scenic ride in town and a shortcut to the historic Praça Municipal and the Pelourinho District, a UNESCO World Heritage Site. On the stone-paved plaza, vendors sell cravinho, a clove-flavored alcoholic drink, and men demonstrate capoeira, an Afro-Brazilian martial art. Inside Sao Francisco Church, we are amazed by the cavernous interior covered with gold, silver, and precious stones. It resembles a giant treasure chest. Before leaving Salvador, we browse through the Modelo Market for African-themed handicrafts and souvenirs. In Natal, the “city of dunes,” we hire a Spanish-speaking Brazilian taxi driver to take us to the 16th-century Tres Reis Magos fortress, and we climb up to the ramparts for a panoramic view of the city. We stop all too briefly at enchanting Ponta Negra Beach, where the impressive Morro do Careca dune cascades 390 feet down to a fringe of silky sand, rugged black boulders, and milky blue-green water. 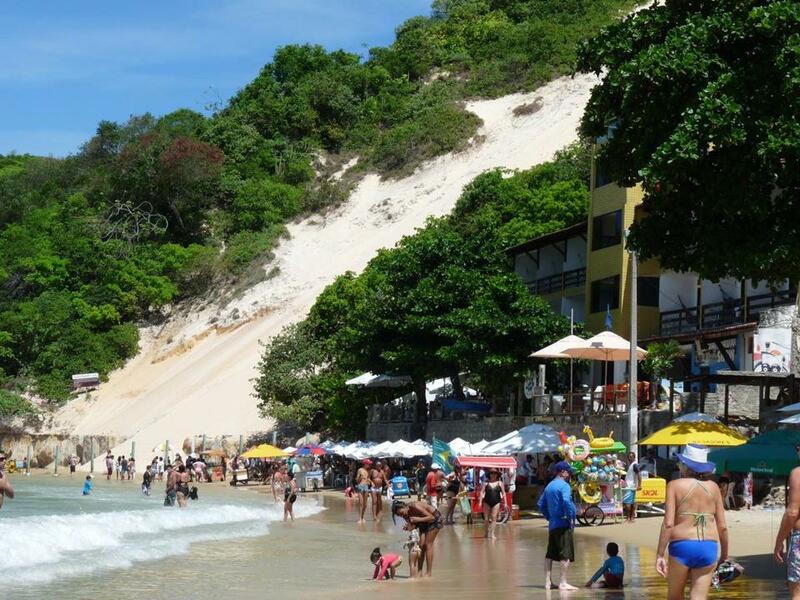 Natal’s stunning Ponta Negra Beach offers a dramatic sand dune and lively beach entertainment. A 30-minute drive takes us to Parnamirim City, home of the world’s largest cashew tree (according to the Guinness Book of Records). We follow a sun-dappled boardwalk beneath the fantastical maze of twisting branches. An observation deck offers a leaf-top view of the tree’s canopy, covering nearly two acres. Vendors sell us roasted cashews and offer samples of cashew-flavored cachaça and liqueur. Leaden skies hover above the luxury seaside condominiums in Fortaleza, whose moniker, “city of sun,” seems more fantasy than fact on a rainy day. Heavy downpours have chased sun seekers from popular Futuro, Mucuripe, and Iracema beaches into the city’s many enclosed shopping centers. We tour the downtown area and admire the magnificent Swiss-made stained-glass windows inside the imposing neo-Gothic Metropolitan Cathedral. At the Emcetur Tourist Center’s handicraft market, we marvel at intricate handmade lace, wood carvings, and basketry. The city’s shoreline glitters like a diamond necklace as we sail away that night. Belem, the gateway to the Amazon, is our final Brazilian port-of-call. At daybreak, a huge yellow-orange orb rises above the dense jungle, and sunlight illuminates the city’s modern skyline. From the pier, we travel to the banks of the coffee-colored Guama River and board a double-decker boat for a cruise to Combu Island. En route, we pass Caboclo Indian stilt houses and a yellow “school boat” taking children to a riverside schoolhouse. Upriver from Belem, guided jungle walks introduce visitors to the rich diversity of Amazonian plants and wildlife. 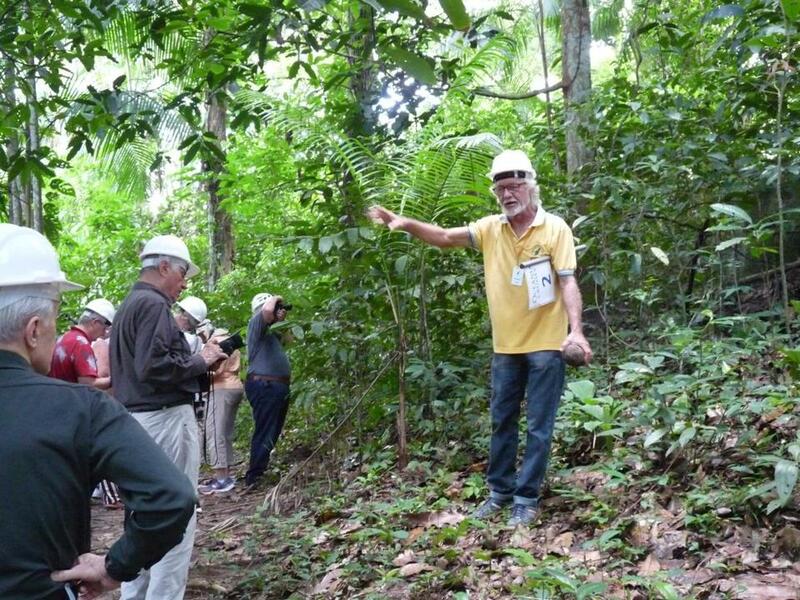 Before our jungle walk, we all don hardhats to protect against falling Brazil nuts as big as baseballs. Our guide, Cicero, unlocks the secrets of the Amazon by introducing us to edible fruits, medicinal plants, and assorted creepy crawlers, including a hairy black tarantula the size of my hand. Indigenous people, he tells us, harvest rainforest products and sell them in Belem. That afternoon, we wander through Ver-O-Peso market, where mysterious herbal medicines, exotic fruit, and Amazon River fish fill the shelves and bins. We explore the Forte Do Castelo, a 17th-century Portuguese fortress with a museum displaying Amazon tribal artifacts, and admire the ornate ceiling and religious paintings inside Our Lady of Grace Cathedral. Back on board the Nautica, we run into Captain Giulio Ressa and ask him about our Brazilian beach cruise.